The Thousand Pounder is a superunique demon mini-boss. He is a huge, humanoid creature with a gigantically-fat stomach and two huge mauls which he dual wields. Thousand Pounder premiered in the WWI 2008 gameplay movie, where a Barbarian defeated him fairly easily. The actual in-game encounter will be much more elaborate and difficult than was seen in that demo. Information unearthed from the beta files indicates that he is found in Act Three. Concept art of the Thousand Pounder(s). Thousand Pounder is a special boss monster, seen in the WWI 2008 gameplay movie and a few related screenshots. It's not known if he's one particular individual out of a whole class of big, fat, dual-wielding, tattooed Demons, or if he's a special, one-of-a-kind demon but the video of the demon hunter suggests he belongs to a class of "fatty" fiends. He's not an Act Boss or a major Quest boss though, that much was made clear in the panels at the WWI event. The demon attacks with two huge blunt weapons, smashing them one at a time, or swinging both at once in a sort of hands-clapping attack, which will deal terrible damage to anything caught between the weapons. Thousand Pounder grows enraged as his life drops below 50%. At that point his tattoos turn red and he begins to move and attack much more quickly. As seen in the WWI 2008 demo movie, Thousand Pounder is summoned up in a scripted event. The Barbarian in the Gameplay movie from WWI 2008 is running through the Forgotten Tombs when he comes upon a circle of five Dark Cultists channelling their energy to call up the Demon. At first there are three pale-skinned youths dancing in the circle. They explode one by one, and then from their blood and flesh the demon is made incarnate. Youths dance, then are sacrificed to call forth Thousand Pounder. While the Barbarian watches, lights began to glow and the Thousand Pounder takes form. First his bones appear, then muscles, then skin over the top, until with a final explosion that sends the Cultists flying, Thousand Pounder bursts into life. Bashiok: At WWI we unveiled the Thousand Pounder and it had this really grand entrance where it was assembled out of the pieces of these sacrificed uh... I guess virgins, if you will. It was such a grand entrance for that monster, how did that come about? Bones form, then are covered by muscle. When he is defeated his death animation is basically the summoning animation in reverse; starting with a huge gout of blood, then his skin sloughs off, followed by his muscles, before his bones clatter to the ground. The title 'Gluttony Incarnate' is a mystery. Comparing this big fella with the Siegebreaker Assault Beast, he seems to have a 'title' that would work very much like Diablo 2 Monster Modifiers. Still, 'Gluttony Incarnate' could be his title just like the Siegebreaker's 'Living Siege Engine of Hell' obviously must be. 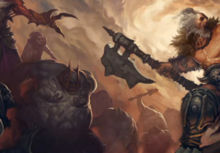 The Thousand Pounder could also very well be an equivalent of a Diablo II Superunique, with a different name than other units that look the same (as the Thousand Pounder has been depicted to come in packs in concept art). Other players have speculated that perhaps we'll see mini-bosses with names inspired by all seven deadly sins. It's purely speculation at this point, but it's as good a guess as any. Enrage - The Thousand Pounder enrages when he reaches 50% health, making his tattoos glow ominously, and increasing his speed and damage. Dark Cultist - These creatures summon the Thousand Pounder. Nothing is specifically known about the background of the Thousand Pounder. 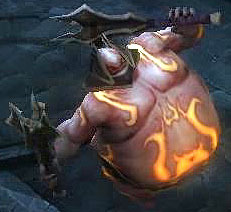 Is it a "Superunique" of this "Fat Demon" kind, or is it a completely new type of monster? The concept art seems to indicate that it's not a unique entity, showing a Barbarian with several of these creatures, but the matter in which he is summoned could suggest he is a little bit of a personality anyway. He is in either way powerful enough to require a quite advanced summoning to enter the physical realm. 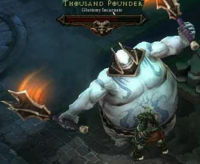 No monster like the Thousand Pounder is seen in Diablo I or Diablo II. Thousand Pounder was discussed in the WWI Denizens of Diablo panel. The other way we emphasize monster character and personality is to look at the monster on whole. How do they get on screen and die? He's going to be on screen in a cool way, so we went to the the Thousand Pounder here. He's all about hell. He's summoned from it literally piece by piece. When he gets on screen we figured he should be made and big. Express anger. Part of his gameplay is that he gets really mad when he's almost dead. Throws a huge temper tantrum and this changes how he plays and how the player has to play against him. When he's enraged we changed how he looked; made his tattoos glow, gave him new attack animations and special effects. When he dies the animation is somewhat a reverse of how he came on screen. We did this to show of the whole idea that he's from hell. A thread was started with this topic in the Unofficial Diablo 3 Forums as well. Concept art: 5 fat-blobs visible. This page was last edited on 11 October 2011, at 16:30.